Mark Waid introduces Cap to Marvel Legacy! On November 1, a new era begins for the Sentinel of Liberty with CAPTAIN AMERICA #695! Marvel Legacy rises as writer Mark Waid and artist Chris Samnee reunite in an attempt to restore Steve Rogers’ reputation—though it won’t be an easy task, as they’ve got to shine a shield tarnished by the events of Secret Empire. Back in the action wearing the famous red-white-and-blue, Captain America faces one of his toughest journeys yet—reconstructing his legacy. How will he tackle the challenge? We caught up with Mark Waid to find out. Marvel.com: What made CAPTAIN AMERICA the best fit for you—and for a reunited Waid-Samnee team—at this moment in time? Mark Waid: It’s the best fit for me not only because I love Steve Rogers, but also because I’m smart enough to hang onto Chris Samnee’s coattails whenever possible. We make a good team, and it’s terrific to finally see Chris cut loose on a top-tier Marvel hero. Marvel.com: How daunting of a task will it be to tell Cap’s story in the wake of Secret Empire? What do you see as the biggest challenge of such an undertaking? Mark Waid: The biggest challenge will be, of course, restoring his reputation post-Secret Empire—but rather than be too bound to a timeline, our fans have made it clear that they want classic Cap, so we’ll be looking forward more than in the rear-view mirror. Beyond that, it’s important to Team Cap that we make one thing abundantly clear: while we’re having a blast and giving you a very classic Steve Rogers, Chris and I have been working on these first few issues since March—way in advance of the more volatile political events of the summer. Because of our lead time, he won’t get around to punching Nazis on page one. But it’s coming. Marvel.com: What does Steve currently see as his biggest hurdle to restoring his rep? Mark Waid: To “find America,” as it were; to reconnect with a heartland he’s never really spent much time in. Steve claims to represent America and yet spends almost all his time in New York. He wants to change that. Marvel.com: Do Americans still support him? Do they resent him? Mark Waid: We’ve built at least a six-month delay from the end of Secret Empire into our first issue, so while there will be dark and shady looks glared his way—and there will be those who don’t trust him—not every issue finds Cap pleading for understanding. In fact, our first issue kind of overcompensates. You’ll see what we mean. Marvel.com: What about the bad guys? How do they feel about Cap now? Mark Waid: They feel that maybe they have a better shot at him, not only because he has no Avengers back-up, but because he’s still a little off his pins after Secret Empire. Marvel.com: What do you foresee as the upcoming adversity for Cap? New threats? Classic threats refreshed? A combination? Marvel.com: Can’t wait! One final question to wrap this up: when you first saw a piece of Chris’s artwork for this book, what went through your mind? Mark Waid: That I should never complain about anything in life ever again. 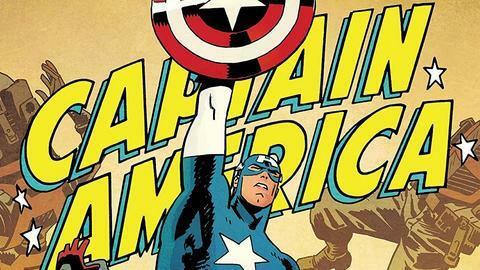 Start a new chapter with CAPTAIN AMERICA #695, by Mark Waid and artist Chris Samnee, on November 1!